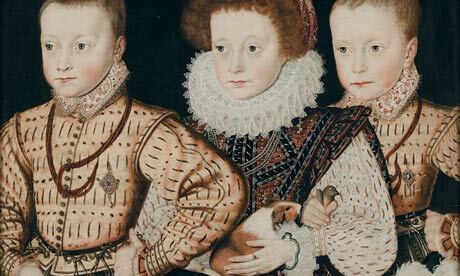 What is believed to be the oldest portrait of a guinea pig in English art has been discovered! Previously in a private collection, it will soon be on display to the public for a short time. The painting is simply titled Three Unknown Elizabethan Children and is from 1580 by an unknown Anglo-Netherlands (probably Flemish or Dutch) artist. The painting features three children, all very well dressed. The boy in front is thought to be 6, the girl 7, and the boy in the back 5 years old. The girl holds the guinea pig while the boy behind her holds what appears to be a finch. Guinea pigs were introduced to Europe by Spanish traders. Once prized meat in their native home, they became popular exotic pets among wealthy Europeans. I do not know how much more their is the painting as all photos of it show only this much. It is very exciting to think that guinea pigs have been such beloved pets that they would make it into a portrait! The painting will be on display in London at the National Portrait Gallery as part of the exhibition Elizabeth I and Her People running from October 10 to January 5, 2014. The exhibit will include other portraits, paintings, and over 100 objects (like costumes and coins). I would encourage anyone in the area to check out the Gallery and this exhibit. I love history and this would be amazing if I could get to it! Story originally from the BBC.